Anti-Cellulite Topical Cream, Net Wt. 6 Oz. This clinically tested skin toning formula decreased the appearance of cellulite by 15.1% in just 2 weeks. The powerful ingredients in RevitaShape keep working with continued use and it can reduce cellulite by up to 90% after 8 weeks. RevitaShape contains a powerful blend of natural herbs and enzymes to help slim, tone and refine problem areas for a slimmer, sleeker you. Order your tube of RevitaShape today! Using your fingertips, massage a liberal amount of the RevitaShape topical cream onto affected areas, including the thighs, buttocks, and tummy. Continue to massage until the lotion has been fully absorbed into the skin. You will notice an immediate tightening of the skin upon application as well as a warm sensation as the ingredients penetrate the skin. For best results, be sure to use RevitaShape Anti-Cellulite Skin Toning Formula twice a day for a minimum of four to six weeks. When applied directly to the skin, caffeine causes the skin to temporarily tighten and firm on contact. Caffeine also improves metabolism, which accelerates the rate at which fat is burned. Glaucine is an anti-inflammatory alkaloid that can help smooth out the unsightly lumps and bumps caused by severe cellulite. Glaucine can also help reduce swelling caused by excess water retention. By alleviating this water build-up, glaucine can help to improve skin firmness for smoother, more even-looking skin. Coenzyme-A is largely responsible for the process by which your body breaks down fatty acids into usable energy. Like L-carnitine, Coenzyme-A helps to break down lipids stored beneath the deeper layers of the skin. This essential amino acid protects against cellular oxidative stress, which causes cellulite, sagging, and reduced skin elasticity. L-carnitine is a potent antioxidant that also works to prevent free radicals from causing long-term damage to your skin's firmness (also known as lipid peroxidation). RevitaShape also contains bladderwrack extracts, Centella asiatica (Gotu Kola) extracts, elderberry extracts, bupleurum falcatum extract, retinyl palmitate, Vitamin C, and tocopheryl acetate (Vitamin E). 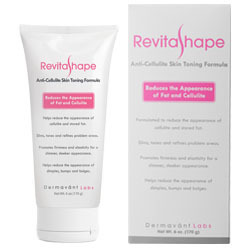 RevitaShape advanced formulation of powerful natural ingredients target the causes of cellulite: water retention, stored body fat, and depleted skin elasticity. In a clinical trial, RevitaShape was proven to reduce the appearance of cellulite. Average reductions in cellulite were measured at 15.1% in 2 weeks, 24.4% in 4 weeks, by 39.5% in 6 weeks and by 51.2% in 8 weeks. Buy It Now for $89.95! Copyright ©2019 DermavantLabs.com. All Rights Reserved.